“The Select (The Sun Also Rises)” is currently playing at the Lansburgh Theater in downtown Washington, D.C. Brought to you by the Shakespeare Theatre Company. “The Select (The Sun Also Rises)” is a fun tale that follows a group of American and British friends and their subsequent adventures from cafés in Paris to the running of the bulls in Spain. The show seems to take special interest in the love life of the protagonist, Jake Barnes and his seemingly-doomed-relationship with Lady Brett Ashley and how the other characters friendships and relationships affect each other. The show is based on Ernest Hemingway’s book “The Sun Also Rises” which is widely considered to be his greatest work. “The Select (The Sun Also Rises)” premiered at the 2010 Edinburgh Festival Fringe and ran at the New York Theatre Workshop Off-Broadway for a month and a half in fall 2011. 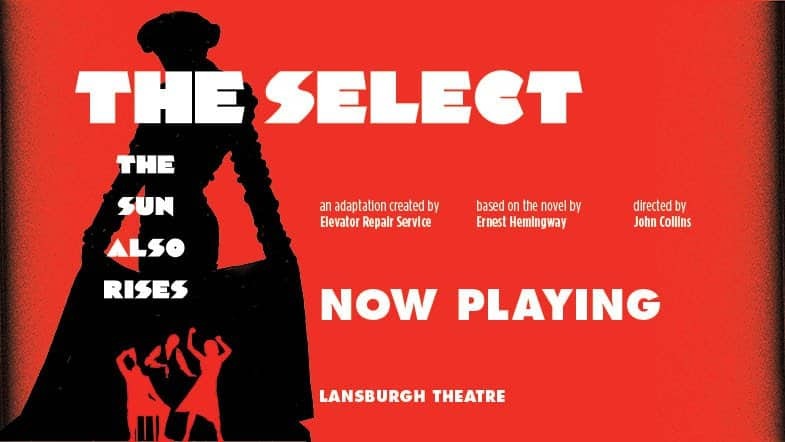 “The Select” is put on by Elevator Repair Service (ERS), a theater group based out of New York and founded in 1991 by John Collins, who also directed and stars in “The Select.” ERS became well-known for “Gatz” a verbatim staging of “The Great Gatsby” by F. Scott Fitzgerald. According to Collins, “Gatz” presented the challenge of translation of literature to stage, and ERS has since adapted several early 20th-century modernism texts. “The Select” engages the audience by allowing them to imagine parts of the set, and engaging their imaginations with witty dialogue and banter between the characters on stage. The small ensemble of actors allows for an intimate feeling between the stage and the audience, bringing them closer together for an experience unparalleled by any other performance. The Lansburgh Theater is located at 450 7th St NW in downtown D.C.
“The Select (The Sun Also Rises)” closes on April 2.